The saying goes, ‘there’s no replacement for displacement.’ The Yamaha FZ25 nods in approval, while the TVS Apache RTR 200 begs to differ. So, which one is on the money? 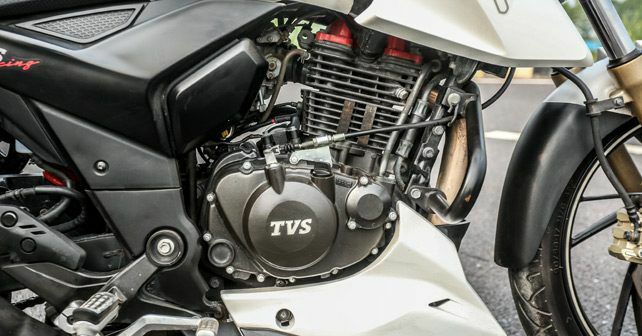 When Yamaha dropped the veil on the FZ25, every motorcycle expert worth their salt had a troubled expression on their face, and just one question in mind: “Doesn’t the more affordable TVS Apache RTR 200 4V develop identical power with fewer CCs?” And, if you think about it, that’s a genuine concern. Not only was the Yamaha FZ25 joining the party a little late in the day, but it also didn’t have the firepower to match (let alone unsettle) its rivals. The FZ25 may not look like a completely new motorcycle from the lesser FZ models, but it stands out – my favourite bit is the MT-03 inspired headlamp with a full-LED setup, it’s a really cool touch. The rest of the design is tastefully done, too – the sharply contoured fuel tank and scooped-out extensions, stubby exhaust, split seats and LED tail-lamp all catch the attention of other road-users. To my eye, the FZ25 has that quintessential street naked demeanour. The RTR 200 4v, on the other hand, is no wallflower either. In fact, compared to the FZ25, the RTR 200 does a better job of distancing itself from its smaller iterations. Design elements, like the sharply sculpted fuel tank and engine cowl, sleek headlamp unit with LED position lamps and an LED tail-lamp add punch to its design. And while it doesn’t get an LED headlamp setup like the FZ25, the RTR 200’s halogen lamp actually offers better illumination. The general fit-and-finish of components is top notch on the TVS. There’s nothing wrong with the Yamaha’s quality levels either, but the touch and feel of the panels and switchgear is marginally better on the Apache. The RTR’s instrument cluster is also better equipped and offers more information than the FZ’s. Keeping true to its Racing DNA theme, the RTR’s all-digital console has a lap timer, top-speed recorder, 0-60 km/h timer and gear position indicator, while there’s also a shift-light. 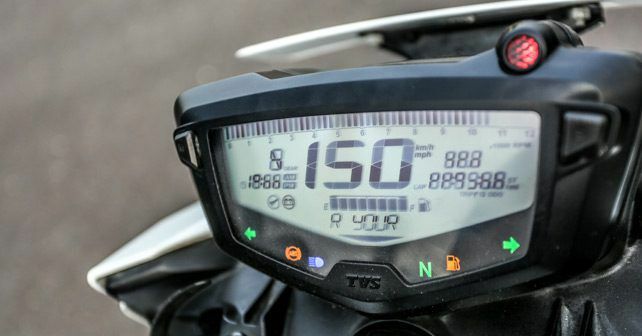 The FZ25’s cluster, in comparison, doesn’t have these fancy readouts – but you do get two trip meters, a clock and a fuel consumption indicator. 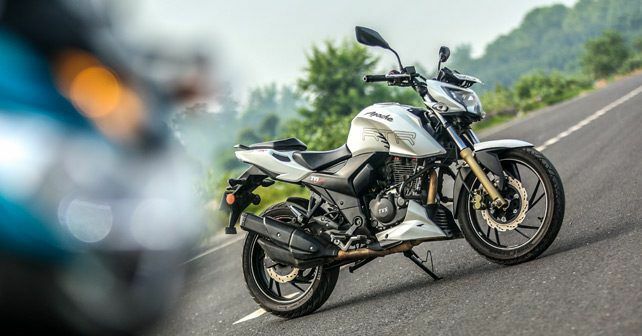 All told, the RTR 200 feels like a better-finished product in terms of fit-and-finish. It also offers a lot more equipment. That being said, I somehow found myself ogling at the Yamaha more than the TVS. If I had to pick one solely based on its visual appeal, I think my vote would go in favour of FZ25. At the heart of the FZ25 is an air-cooled 249cc single-cylinder engine that comes with fuel-injection, a 2-valve arrangement and an oil-cooler. It develops 20.6bhp and 20Nm of torque. Against the Yamaha’s quarter-litre motor, the RTR 200’s air-cooled 198cc single-cylinder carbureted unit is also oil-cooled, but comes with a 4-valve setup for better breathing characteristics. The RTR 200 produces 20.2bhp and 18.1Nm. Since both the bikes weigh exactly 148 kilogrammes, it becomes quite interesting. So, which one is faster in the real world – the FZ25 or RTR 200?If it’s outright acceleration that you’re looking at, the FZ25 creams the RTR 200 without breaking a sweat. In our performance runs, the Yamaha clocked the 0-60km/h sprint at 3.72 seconds, while 0-100km/h was achieved in 10.58 seconds. 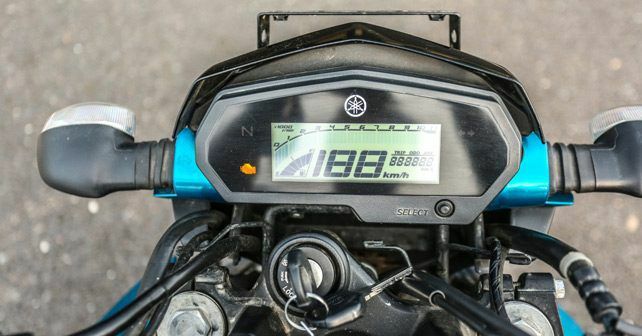 The RTR 200 couldn’t match its time and was over half a second slower to hit 60km/h (4.26s), and over two seconds slower to reach the 100km/h mark (13.12s). More than the powertrain though, I felt that the Apache was harder to launch. That’s because the FZ25’s clutch is lighter and progressive, while the RTR’s clutch has a sudden bite – making it difficult to get that perfect launch. Not only the controls but the FZ25’s motor is more eager to rev – however, if you’re not watchful you’ll keep hitting the 9,000rpm rev-limiter. The meat of the torque lies in between 3,000-6,500rpm, and that’s where you want to be – it’s all about midrange performance here. The most impressive thing about the FZ25 is that it’s deceptively quick – it doesn’t have a sudden kick, but the acceleration is beautifully linear. Both the bikes have 5-speed gearboxes, but the FZ25’s ‘box has shorter ratios – which further helps in exploiting that extra torque from the engine. Now while we may have established that the Apache is the slower one here, it doesn’t necessarily mean that you can dismiss it. You see, between the two, it’s the RTR’s powertrain that feels a bit more involving and punchy. It’s all about midrange here as well, but the throttle response, the exhaust note, and the overall refinement make for a markedly better riding experience. The other reason why I prefer the RTR 200’s engine over the FZ25 is that the TVS feels more refined when pushed harder. No doubt the FZ25 has more juice higher up in the rev range, but once the engine starts spinning faster than 6,000rpm, its handlebar and pegs start to buzz quite ferociously. And, for some weird reason, there was a lot of tappet noise too. It’s not that the RTR doesn’t vibrate, but it’s only after 8,000rpm that it gets noticeable. To sum it up, in day-to-day commute, the RTR feels more enjoyable, while the FZ25 is more tractable – thanks to its extra 2Nm of torque. On the highway, you don’t want to be on either of these, honestly. Both get quite noisy at high speeds, and you’ll miss an additional cog like never before in your life. As for the top speed, the FZ25 beats the RTR 200 here as well since it can hit over 135km/h on the speedo, while the TVS struggles to budge past 130km/h. But then, the Yamaha also feels a lot more strained and completely out of its zone at such speeds. When TVS says that its bikes are developed by the firm’s racing team, just believe it. While the RTR loses out to the FZ in a straight line, it more than makes up for that in the ride-and-handling department. Around a corner, you can immediately tell that the steering is sharper, the turn-in quicker, the grip from the Pirelli rubber is amazing, and the suspension setup is right on the money – it’s not bone jarringly stiff like the earlier RTRs, but, at the same time, it doesn’t pitch or dip when push comes to shove. On the whole, the RTR 200 is a great motorcycle to go fast on. In comparison, the FZ25 is no lousy handler. But, when you push it hard in a corner, it’s clearly evident the suspension is tuned for comfort instead of corner carving. It remains composed and planted, but when you really push, there’s a sense of waywardness – especially from the rear wheel. It’s as if the motorcycle sends a gentle message, asking you to back off.Now, while the Yamaha’s suspension takes on bad roads more effectively, its hard saddle is a real killjoy. The Apache’s seat, in comparison, is nicer – allowing you to be more relaxed behind the handlebar. Another good thing about the RTR 200 is that it doesn’t trade comfort for handling finesse – and so it rides really, really well. Both bikes come equipped with disc brakes at both ends. The RTR 200 features a 270mm (front) and 240mm (rear) setup, while the FZ has a 282mm front disc and a 220mm rear disc. The RTR’s brakes are its weakest link in my opinion – the front doesn’t seem to have adequate bite, and it feels spongy. The FZ’s brakes are much better since there’s more bite and feedback from the lever. ABS is absent on both bikes. TVS might say that the RTR 200 has ABS as an option, but that particular version hasn’t yet reached the showrooms. 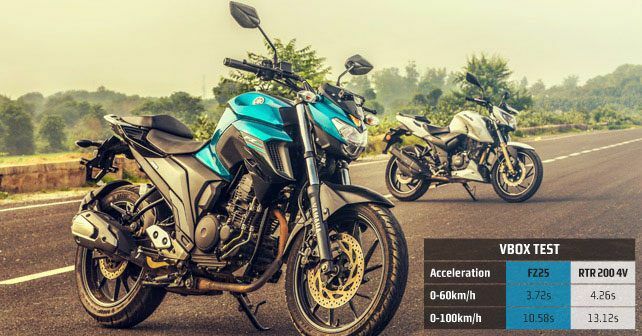 As you may have figured by now, both the FZ25 and RTR 200 are quite evenly matched. Usually, when I’m caught in the middle of such a situation – wherein I have to pick a winner – I tend to bail myself out with diplomatic speak. Not this time though. 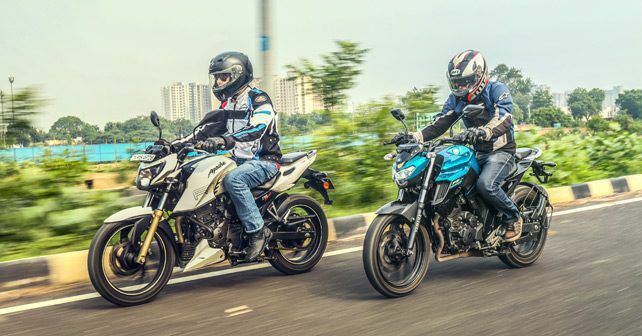 You see, when you ride these bikes back-to-back, it becomes evident that the Apache punches above its weight – it’s more involving, better engineered, and has the more rounded package of the two. Plus, it’s cheaper as well. And so it wins this test. At the same time, though, let’s also make one thing very clear. For every penny you spend on the FZ25, you’re getting your money’s worth. To my eyes, the Yamaha is more striking and more aspirational. Don’t forget, it’s also considerably faster and is an effortless motorcycle to potter around town in. So no one can blame you for putting your money on either of these motorcycles. X-Factor: Stylish, well-built, effortless and deceptively quick.